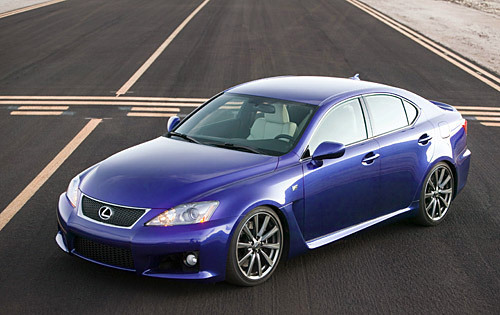 On paper the 2008 Lexus IS-F stacks up well against the M3, not to mention the Audi RS4 and Mercedes-Benz C63 AMG. In the metal, the IS-F’s appearance is polarizing (“F stands for FUGLY! The car looks wack,” said Juzef on an M3 message board we surfed recently), and much of the criticism centers on the car’s bulging hood and distinctive fenders. The IS-F’s big nose might make this car an icon or a joke. This will depend in large part on how it performs. The rest of the article repeats the now-standard IS-F info: More than 400hp, 0-60 in less than 4.9 seconds, etc. etc., surely they’re not still tweaking the car, what reason would they have to still be withholding the facts? My only thought is for shock value, perhaps the final numbers are well north of 400hp and they don’t want to reveal their cards. Still, it’s getting frustrating. Again, and I am repeating myself, I think Lexus has done themselves a disservice by continually featuring this blue IS-F in all of their press coverage. Most of the criticism is for the exterior appearance, and the blue does nothing but fuel the fire. Why not feature the white IS-F for a change, or better yet, throw the black one out there?